Blackhawk S.T.R.I.K.E. 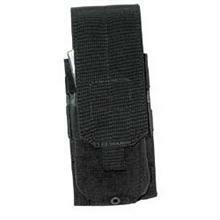 M4 Single Mag Pouch (Holds 2). MOLLE attachment, adjustable lid design. Holds 2xM16/M4, 1x .308, or 1 AK-47 magazine.